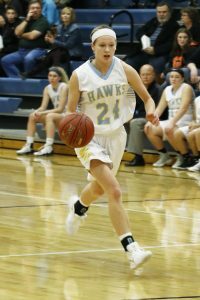 Three starters return to the L-S varsity girls basketball team this year and look to lead the Hawks to a solid season on the court. The Hawks ended their 2016-17 season with a record of 21-3 and were one game from the state tournament. The team graduated two seniors, Brenna Lanser and Jelissa Rozendaal. L-S sophomore Janelle Rozendaal fights for possession of the ball with an E-B-F Rocket. This year’s varsity squad is made up of 12 girls, including four returning seniors: Jataya Meyer, Christine Nikkel, Camryn Russell, and Mariah Vos. Russell and Vos are returning starters, along with junior Carson Fisk. Fisk was a critical scorer on the team last year with 260 points and also had 35 assists and 52 steals. 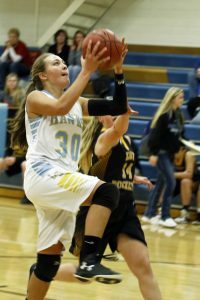 Vos added 159 points, 34 assists, and 41 steals. Russell tallied up 112 points and 33 steals. Russell also tied Lanser with the most assists on the team with 65. This will be L-S Coach Jerry Hulsing’s 27th year coaching at Lynnville-Sully. The team is looking to improve on last season by making an appearance at the state basketball tournament at Wells Fargo Arena. They came up one game short from the state tournament last year, losing to Bellevue Marquette Catholic, 53-46. Senior Mariah Vos goes up strong for a layup against the Rockets. Vos scored two points and had one rebound in the half game. L-S dominated, 34-11. Coach Hulsing saw the jamboree game as a good start to the season. “We started a little slow, but once we started communicating on defense, we were able to get some turnovers and ran the floor well, leading to some easy baskets,” he said. The coach would like to see his team’s half-court offense move the ball better to help his players get good looks at the basket. Fisk led the offense with 13 points, followed by junior Shiloh Cunningham with six. Sophomore Janelle Rozendaal and senior Christine Nikkel contributed four points each. 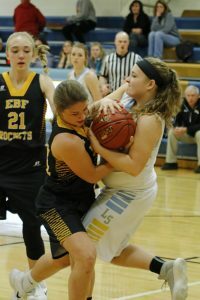 As a team, the Hawks had 21 rebounds compared to E-B-F’s 18. Cunningham pulled down four on the boards, and Fisk had three. Junior Carson Fisk brings the ball up court for the Hawks in the half game against E-B-F on Monday, Nov. 13. She was the leading scorer.